For other uses, see Silt (disambiguation). Silt is granular material of a size between sand and clay, whose mineral origin is quartz and feldspar. 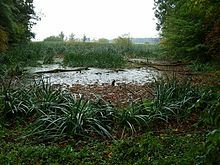 Silt may occur as a soil (often mixed with sand or clay) or as sediment mixed in suspension with water (also known as a suspended load) and soil in a body of water such as a river. It may also exist as soil deposited at the bottom of a water body, like mudflows from landslides. Silt has a moderate specific area with a typically non-sticky, plastic feel. Silt usually has a floury feel when dry, and a slippery feel when wet. Silt can be visually observed with a hand lens, exhibiting a sparkly appearance. It also can be felt by the tongue as granular when placed on the front teeth (even when mixed with clay particles). Silt is created by a variety of physical processes capable of splitting the generally sand-sized quartz crystals of primary rocks by exploiting deficiencies in their lattice. These involve chemical weathering of rock and regolith, and a number of physical weathering processes such as frost shattering and haloclasty. The main process is abrasion through transport, including fluvial comminution, aeolian attrition and glacial grinding. It is in semi-arid environments that substantial quantities of silt are produced. Silt is sometimes known as "rock flour" or "stone dust", especially when produced by glacial action. Mineralogically, silt is composed mainly of quartz and feldspar. Sedimentary rock composed mainly of silt is known as siltstone. Liquefaction created by a strong earthquake is silt suspended in water that is hydrodynamically forced up from below ground level. In the Udden–Wentworth scale (due to Krumbein), silt particles range between 0.0039 and 0.0625 mm, larger than clay but smaller than sand particles. ISO 14688 grades silts between 0.002 mm and 0.063 mm (sub-divided up into three grades fine, medium and coarse 0.002 mm to 0.006 mm to 0.020 mm to 0.063 mm). In actuality, silt is chemically distinct from clay, and unlike clay, grains of silt are approximately the same size in all dimensions; furthermore, their size ranges overlap. Clays are formed from thin plate-shaped particles held together by electrostatic forces, so present a cohesion. Pure silts are not cohesive. According to the U.S. Department of Agriculture Soil Texture Classification system, the sand–silt distinction is made at the 0.05 mm particle size. The USDA system has been adopted by the Food and Agriculture Organization (FAO). In the Unified Soil Classification System (USCS) and the AASHTO Soil Classification system, the sand–silt distinction is made at the 0.075 mm particle size (i.e., material passing the #200 sieve). Silts and clays are distinguished mechanically by their plasticity. Silt is easily transported in water or other liquid and is fine enough to be carried long distances by air in the form of dust. Thick deposits of silty material resulting from deposition by aeolian processes are often called loess. Silt and clay contribute to turbidity in water. Silt is transported by streams or by water currents in the ocean. When silt appears as a pollutant in water the phenomenon is known as siltation. Silt, deposited by annual floods along the Nile River, created the rich, fertile soil that sustained the Ancient Egyptian civilization. Silt deposited by the Mississippi River throughout the 20th century has decreased due to a system of levees, contributing to the disappearance of protective wetlands and barrier islands in the delta region surrounding New Orleans. In southeast Bangladesh, in the Noakhali district, cross dams were built in the 1960s whereby silt gradually started forming new land called "chars". The district of Noakhali has gained more than 73 square kilometres (28 sq mi) of land in the past 50 years. With Dutch funding, the Bangladeshi government began to help develop older chars in the late 1970s, and the effort has since become a multi-agency operation building roads, culverts, embankments, cyclone shelters, toilets and ponds, as well as distributing land to settlers. By fall 2010, the program will have allotted some 100 square kilometres (20,000 acres) to 21,000 families. A main source of silt in urban rivers is disturbance of soil by construction activity. A main source in rural rivers is erosion from plowing of farm fields, clearcutting or slash and burn treatment of forests. The fertile black silt of the Nile river's banks is a symbol of rebirth, associated with the Egyptian god Anubis. Wikimedia Commons has media related to Silt. ^ Assallay, A. (November 1998). "Silt: 2–62 μm, 9–4φ". Earth-Science Reviews. 45 (1–2): 61–88. Bibcode:1998ESRv...45...61A. doi:10.1016/S0012-8252(98)00035-X. ^ Moss, A. J.; Green, Patricia (1975). "Sand and silt grains: Predetermination of their formation and properties by microfractures in quartz". Journal of the Geological Society of Australia. 22 (4): 485–495. Bibcode:1975AuJES..22..485M. doi:10.1080/00167617508728913. ^ Nahon, D.; Trompette, R. (February 1982). "Origin of siltstones: glacial grinding versus weathering". Sedimentology. 29 (1): 25–35. Bibcode:1982Sedim..29...25N. doi:10.1111/j.1365-3091.1982.tb01706.x. ^ Lautridou, J. P.; Ozouf, J. C. (19 August 2016). "Experimental frost shattering". Progress in Physical Geography. 6 (2): 215–232. doi:10.1177/030913338200600202. ^ Goudie, A. S.; Watson, A. (January 1984). "Rock block monitoring of rapid salt weathering in southern Tunisia". Earth Surface Processes and Landforms. 9 (1): 95–98. Bibcode:1984ESPL....9...95G. doi:10.1002/esp.3290090112. ^ Wright, J.; Smith, B.; Whalley, B. (May 1998). "Mechanisms of loess-sized quartz silt production and their relative effectiveness: laboratory simulations". Geomorphology. 23 (1): 15–34. Bibcode:1998Geomo..23...15W. doi:10.1016/S0169-555X(97)00084-6. ^ Haberlah, D. (June 2007). "A call for Australian loess". Area. 39 (2): 224–229. doi:10.1111/j.1475-4762.2007.00730.x. ^ "Particle Size (618.43)". National Soil Survey Handbook Part 618 (42-55) Soil Properties and Qualities. United States Department of Agriculture - Natural Resource Conservation Service. Archived from the original on 2006-05-27. Retrieved 2006-05-31. ^ "Mississippi River". USGS Biological Resources. Archived from the original on 2005-10-28. Retrieved 2006-03-08. ^ "Bangladesh fights for survival against climate change". Archived from the original on February 12, 2010. Retrieved October 22, 2009. ^ Leedy, Daniel L.; Franklin, Thomas M.; Maestro, Robert M. (1981). Planning for Urban Fishing and Waterfront Recreation. U.S. Department of the Interior, Fish and Wildlife Service, Eastern Energy and Land Use Team. Archived from the original on 2017-12-24.